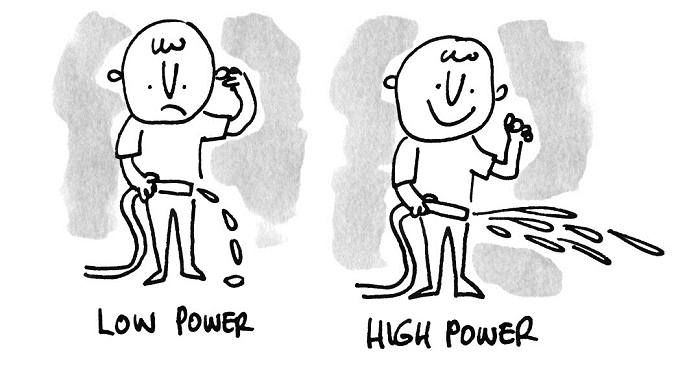 What Is The Difference Between Power And Energy? An Explanation. Knowing the difference between power and energy is important. First I’ll define the two terms, then explain why understanding the difference is critical when dealing with solar power. Power is the rate at which energy flows. Here are some examples when talking about electricity. If you think of electrical current as water in a hosepipe, its power is the flow rate at which the water travels. Figure 1.1 Electrical power is analogous to the flow rate of water through a hosepipe. The size of a solar system is defined by the ‘peak power’ in kW, of its solar array (where ‘solar array’ is the collective term for all the solar panels). For example, a 3 kW solar system, might consist of ten 300W solar panels on the roof. This solar array can push electricity out at a maximum rate of 3 kW (3,000 watts). For most of the day the solar panels will not produce at their peak power. Only in full midday summer sun, in perfect conditions and with perfectly clean panels, will the electricity flow out of those panels at the system’s nameplate peak power. For example, that 3 kW solar array should give out 3 kW of power under perfect conditions. 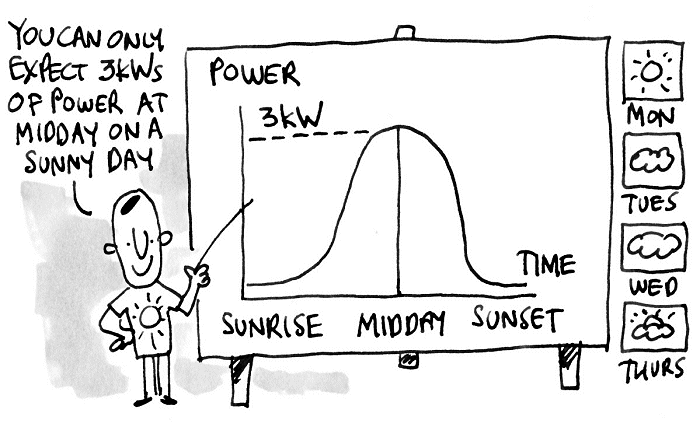 Figure 1.2 The power from a 3 kW solar system changes throughout a continuously sunny day. So the curve for a 3 kW system in the real world typically peaks at closer to 2.4 kW. To recap, a solar system’s size is defined by the peak power output of the solar array. The abbreviation kWh stands for kilowatt-hour. 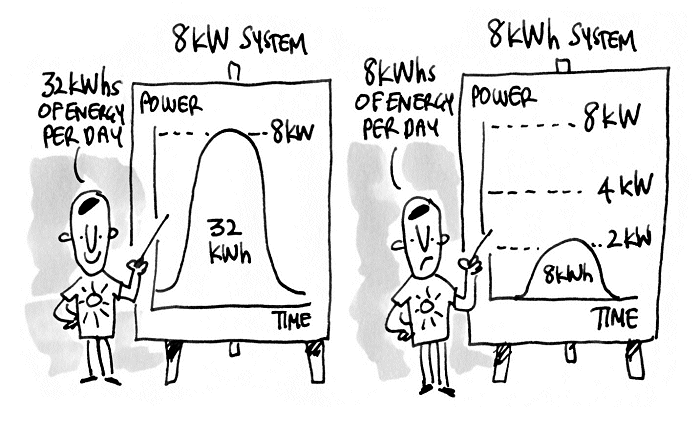 A kWh is a measure of energy (not power). Energy is how much electricity has been generated, stored, or consumed over time. 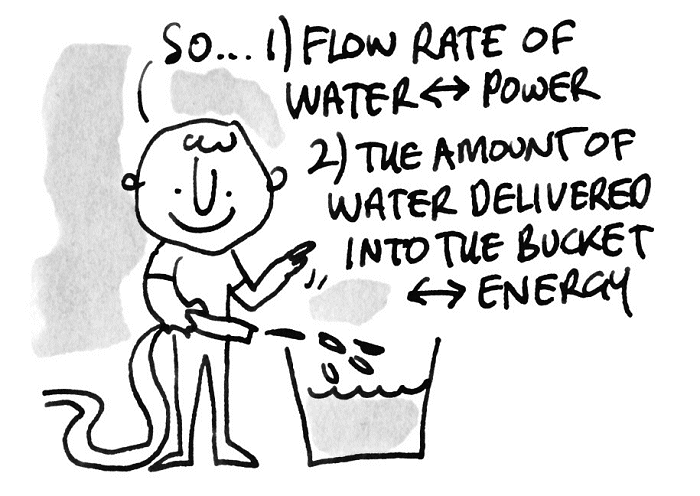 With our water analogy, where power is analogous to flow rate, if the flow is directed at a bucket, the amount of water collected in the bucket is analogous to electrical energy. If your solar panels (for example) continuously give out 5 kW of power for a whole hour, you will have produced 5 kWh of energy. That energy could get used by your appliances, it could be exported to the grid or, if you want to get fancy, it could be stored in a battery – just like storing water in a bucket. Or it could be divided among the three. The amount of electricity you use (or generate or store) is defined in kWh. For example, ‘My solar system produced 4 kWh of electricity today!’ or ‘My heater used 2 kWh of electricity today’ or ‘This battery can store up to 10 kWh of energy’. Key point: A good way to cement the difference between power and energy is the battery and bucket analogy. With a bucket and a hose, the higher the power of the hose, the faster you can fill your bucket. The size of the bucket determines how much water the bucket can accept. With a battery, the higher the power rating of the battery (in kW), the faster you can fill or empty the battery. The higher the energy capacity (in kWh) of the battery, the more electricity it can store. When you get billed for electricity, you get billed for how many kWh of energy you have used. At the highest level, kW measures power, and kWh measures energy. 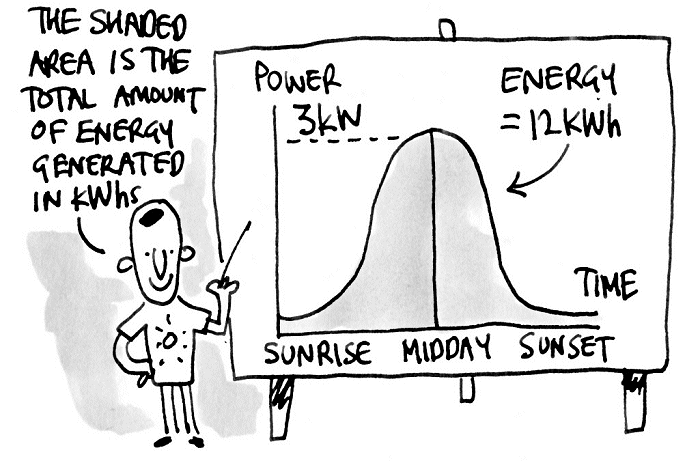 Figure 1.4 The energy generated by a solar system in one day is the area under the power curve. Knowing the difference between energy and power is important? It is common for people to mistakenly interchange the terms energy and power as if there were no difference. Most people do it all the time without noticing, even many electricians. It drives electrical geeks like me up the wall. Especially when I read it in national newspapers and books! For example, if someone is talking about their electricity use and says, ‘I used 8 kW yesterday,’ strictly speaking, they mean, ‘At one point in time yesterday my power demand got to the point when I was pulling 8 kW of power from the grid.’ It gives us no indication of how much energy they actually used – only the peak power they hit. Yeah, yeah, I know what you’re thinking: who cares? Well, it’s like our driver saying ‘I went 140 kph’ when they actually meant ‘I went 140 km’. It totally changes the meaning, and causes ambiguity that could be costly. This is important if you’re buying a solar system. If someone says they need a solar power system to produce 8 kW, they might end up being quoted for an 8 kW solar system. That will cost about $10,000 at today’s prices and produce about 32 kWh of energy per day averaged over a year. Figure 1.5 An 8 kW solar system is much bigger than an 8 kWh solar system. Please don’t confuse kW and kWh. If you do, you may end up with a solar system that’s completely the wrong size. If what they actually meant was that they needed to cover an energy use of 8 kWh per day then they really need a 2 kW solar system, which costs about $3,000 at the time of writing and produces, on average, 8 kWh of energy per day. A simple way to estimate how much energy you can expect, on average, per day from a solar system in Australia is to multiply the system size by 4. For example, a 5 kW system will average around 20 kWh of energy production per day. Ask them to explain the difference between a kW and kWh. If they get this wrong, how on earth will they understand your requirements? A lot of cold-calling door-knockers and solar telesales people will fail this test. In fact, never entertain a cold call by phone or at the door. Now you know the difference between solar power and solar energy (or, more generally, the difference between power and energy), you are well equipped for a future where you take more responsibility for your own energy. It’s like knowing what a gigabyte is – unthinkable ten years ago, indispensable now if you want to understand whether your next smartphone will store all your apps, photos and videos. 3OK, OK, Hyundais can totally do 140 kph. All that’s required is a cliff.